To fondle with the mouth close. The opposition of a contrary quality, by which the quality opposed acquires strength; or the action by which a body attacked collects force by opposition; or the intension of the activity of one quality by the opposition of another. Thus quick-lime is set on fire, or sensible heat is excited in it, by mixture with water; and cold applied to the human body may increase its heat. A small stone of a roundish form, and of no determinate size, found on the sea shore and on the banks or in the channels of rivers, &c., worn smooth or rounded by the action of water; a pebble. To return, as sound reverberated; to echo. To act reciprocally, as the strings of an instrument to the hand. Low; deep in the throat; guttural; rumbling; as a grum voice. To work double tides, in the language of seamen, to perform the labor of three days in two; a phrase taken from the practice of working by the night tide as well as by the day. A large and thick collection of trees. To fish for eels, by thrusting the bait into their holes. A vegetable; an organic body, destitute of sense and spontaneous motion, adhering to another body in such a manner as to draw from it its nourishment, and having the power of propagating itself by seeds; "whose seed is in itself." Gen.1. This definition may not be perfectly correct, as it respects all plants, for some marine plants grow without being attached to any fixed body. In other news... Three Noah Webster assemblages are featured in the current issue of Lamination Colony. A fish of the genus mugil. The lips are membranaceous; the inferior one carinated inwards; it has no teeth, and the body is of a whitish color. This fish frequents the shore and roots in the sand like a hog. It is an excellent fish for the table. A pole set up as a mark to direct seamen how to keep the channel, in shallow water. 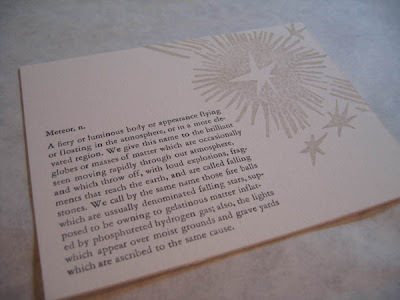 Noah Webster's poem "Meteor" is featured this month on a letterpress postcard from the expert practitioners at YES Press. These folks have been making beautiful work for nearly a year now, in collaboration with independent artists and poets. Postcards are $3 at the YES Press shop. To murmur like a hog; to utter a short groan or a deep guttural sound. In common usage, any small creeping animal, or reptile, either entirely without feet, or with very short ones, including a great variety of animals of different classes and orders, viz. certain small serpents, as the blind-worm or slow-worm; the larvas of insects, viz. grubs, caterpillars and maggots, as the wood-worm, canker-worm, silk-worm, (the larva of a moth which spins the filaments of which silk is made,) the grub that injures corn, grass, &c., the worms that breed in putrid flesh, the bots in the stomach of horses, and many others; certain wingless insects, as the glow-worm; the intestinal worms, or such as breed in the cavities and organs of living animals, as the tape-worm, the round-worm, the fluke, &c.; and numerous animals found in the earth, and in water, particularly in the sea, as the earth-worm or lumbricus, the hair-worm or gordius, the teredo, or worm that bores in to the bottom of ships, &c.
Originally, the name of a street near Moorfields, in London, much inhabited by mean writers; hence applied to mean writings; as a Grubstreet poem. To mangle with the teeth. A small collection of standing water; a puddle. The outer edge of any thing; the extreme part or surrounding line; the confine or exterior limit of a country, or of any region or tract of land; the exterior part or edge of a garment, or of the corol of plants; the rim or brim of a vessel, but not often applied to vessels; the exterior part of a garden, and hence a bank raised at the side of a garden, for the cultivation of flowers, and a row of plants; in short, the outer part or edge of things too numerous to be specified.